Please Note: This review is based on the Las Vegas location, and we haven't visited the Michigan locations yet. What makes this place different? Shake Shack just does everything the right way, from quality, healthy ingredients, to charity events and promotions. Shake Shack made its debut in New York City as a food cart inside Madison Square Park in 2000. Once they became popular, they ended up as an actual burger stand within the park. Now they have locations all over the place, and they’ve really exploded on the burger scene. Is there one in Michigan now? Yes, downtown Detroit, and there's also one in Troy. Tell me some more. They started their business by just selling New York style hamburgers. Once the popularity hit, they expanded to fries, hot dogs, chicken sandwiches (Chicken Shack), and shakes. Many locations also serve alcoholic beverages. Shake Shack is an East Coast thing. Thrillest.com once did an East Coast versus West Coast burger contest, pitting Shake Shack up against In-N-Out Burger. How's the service and such? This is a strong team of hard working individuals. You'll notice how hard they work right away. What's up with the beef? Shake Shack uses all-natural, 100% angus beef only. Their meat is completely free of hormones and antibiotics. In fact, they pride themselves on the healthiest possible ingredients in the burger industry. What did you get and how was it? I ordered a double cheeseburger, and all of their burgers are cooked to medium unless otherwise desired. They smash the burgers down on the griddle which forms some crispy edges. My burger came out just perfect, and the thing went down too fast. This is an amazing burger and it's highly recommended. 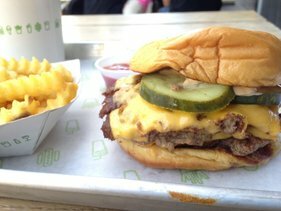 Make sure you check out the Inside Story of How Shake Shack Makes Their Cheeseburgers So Delicious from epicurious.com, and note how they don’t flip their burgers. Chili's? 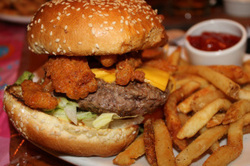 Sure, it's your all over the place chain, but they've got an impressive burger worth mentioning. What's a little Chili's background? The first Chili’s restaurant opened in 1975 in Dallas, Texas, and the building used was a converted postal station. Their original concept was hamburgers, as they offered up a lot of different kinds at good prices. Alright, get to it. I’ve now had their newest version of the Southern Smokehouse Burger two times, and it’s beyond delicious. Simply put, they’re doing everything the right way. Can you tell us about their latest line of burgers? Chili’s has brought back the burger. All of their burgers are now ½ pound, hand-formed, and fresh. If you take that combination and cook it to order, it’s a winning situation and it’s the burger template that all should follow. What did you order? 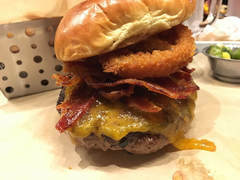 I went for the Southern Smokehouse Burger, which when you run the full gamut, you’re looking at bacon, cheddar, pickles, panko onion rings, lettuce, tomato, and Chili’s signature sauce. It’s also served with a side of original BBQ sauce. I skipped the lettuce and tomato to take a deeper dive into the good stuff. I ordered it at a medium temperature. What's your final take? The Southern Smokehouse Burger is flat out delicious. Where are the Michigan locations? Detroit (Greektown), Detroit (Food Truck), Flint (coming soon as of 1/16/19), Royal Oak (coming soon as of 1/16/19), and Taylor. Click here for an updated list. What's first? We weren't sure if the Boston-based Wahlburgers was ever going to be a destination for Michigan Burger Boys. We aren’t impressed with the corporate flare that’s attached to this chain. The television show and everything else doesn’t seem to add up to a place that’s a fit for us. However, my buddy Gerbe and I found ourselves in Detroit’s Greektown neighborhood at around 9:00pm, and we were hungry. Wahlburgers it was. What's the Greektown location like? When we entered, we were swarmed by posters and everything else promoting the television show. This is the exact reason why I didn’t want any part of it. We headed to the upstairs bar area and the place was pretty busy. When we sat down at the bar and ordered a beer, we were really impressed by their Wahlbrewski. It’s an IPA that was created by the Wahlburger team, and when they implement it at a new location, they have all of the local breweries use their recipe and make it. Then, the brewery that makes it the best, gets to continue making it for the restaurant. Very cool, and Roak Brewing Company in Royal Oak won the rights for the Detroit area. Great idea and this was nicely implemented by Wahlburgers. The burgers? We both ordered their Double Decker, which includes two 3-ounce patties. We were able to order how we wanted them cooked, and I went for medium. I was going to be shocked if they would deliver on two 3-ounce patties being cooked medium. Time would tell. Their thin crispy onion rings seemed to be a staple of the restaurant, so we ordered some of those as well. How was it? When our food came, it looked delicious. A massive amount of those thin crispy onion rings showed up, and I couldn’t help but think about how Five Guys does something similar with their massive quantity of french fries. As far as the taste goes, to my surprise, they nailed it and it was delicious. I'm excited to go back again sometime. Anything else? As mentioned, they nailed those thin patties being cooked to medium. Good work, Wahlburgers. You usually don’t see thin patties like that being cooked to order, let alone accomplished. The meat was juicy and it was an overall good burger experience. When you’re in a place like downtown Detroit, Grand Rapids, Jackson, Ann Arbor, Lansing, or anywhere really, choose something that’s not a chain if you’ve got the time. There are so many great spots out there with fantastic burgers, culture, and environments that can't be duplicated. Support the places that are trying to make it work without the chain backing. Branch out and you'll find some really unique places. ​Where are the locations in Michigan? Click this link for a complete list. Unfortunately, many in Michigan have closed, but quite a few remain open. What's the first thing that comes to mind? They continue to improve their burgers, and they've come a long way since opening. Tell us more about the burgers. 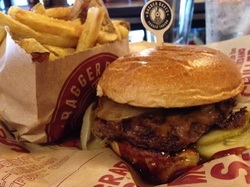 Bagger Dave’s has improved the burger by creating hand formed patties that are not only scrumptious in appearance, but thicker as well. This has proven to carry a more delicious, juicy burger. It's a prime rib recipe. Drinks? One thing that a lot of people enjoy is the Bagger Dave's bar area. They have a lot of craft beers on tap to enjoy. Final thoughts on the burger? It's good and worth trying. We'd peg the last one we had in there at about an 8/10 for taste. Anything else? The train is cool. Where are all of the different HopCat locations in Michigan? Click here for a complete list. What HopCat's theme or what are they known for? They offer a ton of craft beers on tap. At their East Lansing location, they have 100 on tap, and that’s not a misprint. Needless to say, it’s a craft beer fan’s heaven. Their mission is pretty simple - to provide you with beer that’s been made with care and pride, whether it’s local or global. What's some good food to have with the beer? Their Crack Fries (now called Cosmik Fries) are known to many and it’s what most people order alongside their first beer. To me, they are just over-seasoned general french fries, but most love them and you’ve probably heard of them. How about the burger? Through the years, I’ve had high hopes, mostly due to HopCat and Stella’s Lounge being under the same ownership. 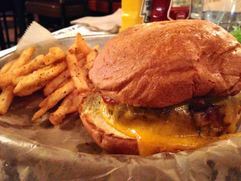 Stella’s Lounge in Grand Rapids offers up one of our favorite burgers and burger experiences. On HopCat’s menu, they’ve got an entire Burgers section, and ten different options are available. How was it? I've had their burger two times. On the first visit, it was terrible. Things improved a little bit on the second visit. Overall impression? My advice is to go to HopCat, drink some craft beer, and enjoy some fries, Pretzel Nuggz, and other appetizers. Don’t go there expecting a well-rounded meal. I enjoy HopCat, but just not for a burger. Isn't this fast food? Culver’s is right on the edge of fast food. Some place it directly in the fast food category, while others place it a step better. Either way, they’re known for their Butter Burgers and Fresh Frozen Custard, and when put together, it’s a very solid combination when you’re in a pinch. 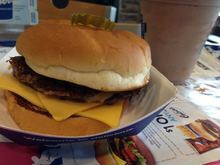 To us, and we hope you’ll agree after reading this review, Culver’s is not fast food. It’s better quality and it just tastes better too. What's their history? While doing our typical deep research, we learned that Culver’s has quite the history. Click here for more. How's their beef? Culver’s believes in doing things the same today as they were done back when their butter burger creation began. They use fresh, never frozen, 100% midwest beef, seared to perfection, and served on a lightly buttered toasted bun. What's the options? Their current menu has nine different burgers to choose from, and make sure you grab a double while making your selection. Sides and such? The frozen custard can come in a variety of styles, including the popular Concrete Mixer. Their sides and other food options are nearly endless. Other sandwiches, chicken, fish, crinkle cut french fries, thick cut onion rings, cole slaw, Wisconsin cheese curds, green beans, and the list literally goes on and on. Grab a Butter Burger, pick a side, select a frozen custard, and trust us, you’ll be all set. Final recommendation? Double Butter Burger, side of crinkle cut fries, and a Concrete Mixer with chocolate and Reese's Peanut Butter Cup. Where are the Michigan locations? They are both in Ann Arbor. Click here for more information. What do they want you to know? 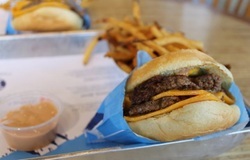 At Elevation Burger, they want you to know that ingredients matter. They have “elevated” the product and made it fresh and flavorful. They want it better for you and better for the environment. How was your experience? Really good. When we walked in, we were greeted by Elevation Burger’s Ann Arbor owner, Mike Tayter. Along with his wife, Sarah, they plan on opening up a few more Elevation Burgers in Michigan. He seemed to be right at home, and what a hard worker. You could tell he really cares about Elevation Burger. What did you order? 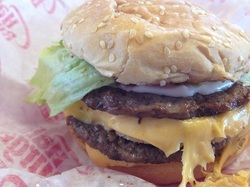 We both went for a double cheeseburger, and Lucas tried his with the Elevation Sauce, which has a tangy-tomato flavor. If you’re a new-age burger joint, you’ve got to have your own sauce, right? How was the burger? Their standard double burger offers the freshest meat you can find. The meat comes from 100% organic grass fed cattle. It’s also 100% free-range and 100% ground-on-premises beef. The result of all of their care is a burger that is much juicier than the rest. The only real negative is that it seemed a bit small. What's so freakin' unbelievable about this place? Nothing that I can see. So, why do they say the burgers are freakin' unbelievable? I'm really not that sure. Maybe it's because they let you BYOFB (build your own freakin' burger). How did the burger add up? The burger as a whole is extremely picturesque. The brioche bun was the right size and toasted for a nice taste. The burger is dressed up with plenty of fixings, but the perfectly circular formed patties are very thin. We were both left wanting more meat. It seems like the burger itself could be a force to be reckoned with if only it were made the star of the show. I kept thinking how cool it would be to combine the two patties together to make one and then double it. It wouldn’t bother me one bit if they raised the price by a few bucks to do this. In the end, I’m not all that freakin’ impressed. Do they have sides that bring happiness? Sides include fries, onion straws, potato fries, smothered fries, fried pickles, jalapeno poppers, fried green beans, fried portobello mushroom. Many beverages from fountain pop to Michigan craft beer! Some beers are available on draft. So, why go here? I guess I would go here if I had to. They have interesting sauces and toppings with many gimmick burgers to choose from. Nothing beats a great burger bar, but a place like this is good for a nice, good, quick fix. Would you bring your dad here? No. Where are the locations in Michigan? There is only one and it's in Northville. What does this burger chain pride themselves on? This is a burger chain that’s all about being environmentally friendly. Their burgers are made from USA-sourced Angus beef made from grass fed cattle and served with a variety of topping options. According to BurgerFi, the natural Angus is free of antibiotics, hormones and additives providing a healthier and more flavorful beef for consumers. Seems to be a theme lately. Yes, for sure. Beyond the meat, their chairs are made from recycled Coke bottles, tables are made out of compressed recycled wood and large fans use 66 percent less electricity. One of the core values of BurgerFi is protecting the environment. What are their burger options? At the ordering counter, there’s plenty for you to choose from. They have a few burger options, and even a “build your best burger” option where the customer gets to create the burger from the amount of patties right through their large variety of toppings. 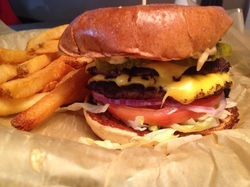 One burger that has many talking is the B.A.D. Burger, which stands for Breakfast All Day Burger. It consists of Natural Angus burger, American cheese, hickory bacon drizzled hash browns, grilled diced onions, and ketchup. What did you go for? I went for their standard Double Angus Burger, and after you order the basic burger, what makes this place pretty unique, as mentioned above, is the large variety of toppings to then choose from. One could throw on potato chips, a fried egg, BurgerFi Chili, cheeses, produce, A-1 Sauce, BurgerFi Sauce, and so much more. 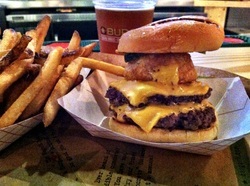 With my burger, I went for the BurgerFi Sauce, American Cheese, and an onion ring. Good? Yes, this is a very, very good burger. It's probably one of the best chain burgers there is. Where's my nearest Steak 'n Shake? They're everywhere. Find a location with your zip code here. What's the vibe at a Steak 'n Shake? It's an old-school diner-style environment, and the menu can fire you up quick with a lot of nice possibilities. King-sized shakes and a large burger variety can set anyone up to have a pretty good experience. What's their history? The original Steak ‘n Shake was founded by Gus Belt in Normal, Illinois. He was the owner of a combination gas station and chicken restaurant, which he converted over to a hamburger stand. That hamburger stand in Normal, Illinois, after a fire and rebuild, became the very first Steak ‘n Shake. Steakburgers, right? Yes, steakburgers. These burgers are a blend of T-bone, sirloin, and round steak. They are one of the rare locations that serve up these kind of burgers. What are the options? We were pleasantly surprised by the large variety of burger options. There were tons of burgers we wanted to try, including the Double or Triple Cheeseburger, Bleu Ribbon, Western BBQ and Bacon, the Wisconsin Buttery, a variety shooter pack, and there’s even more. As for our visit, Lucas landed the Triple Cheeseburger and Kevin had the Wisconsin Buttery. How are the shakes and burgers? Great and great. Steak ‘n Shake is still serving their hand-dipped masterpieces the same way they did back in 1934. The shakes are monsters, and for once, you can order a shake and enjoy it before, during, and maybe even a little after your meal. Although their meat isn't at the quality of some of the more new-age burger joints, we had great flavor and were overall surprised by how much we enjoyed them. This is a decent spot when you're in a pinch. 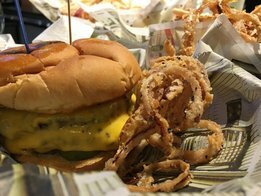 ​Should this burger make people passing through mid Michigan stop for a burger? I think it should. It's a good burger and they won't disappoint. What makes this such an important part of Michigan burger history? Halo Burger is a fresh chain burger that is fast and will not disappoint the public searching for something tasty. 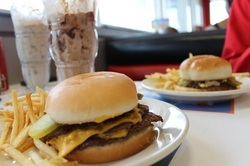 A staple of the Flint area, Halo Burger has been around for over 80 years! Now there are 11 Halo Burger locations ranging from Birch Run to Fenton. How's the burger stack up? All their hamburgers include 100% fresh ground beef with ketchup, mustard, pickles, onions, mayo, lettuce, and tomato. Love at first sight! As soon as I unwrapped the burger I felt good about my visit. The bun is the right size and it’s fresh and soft. The meat was juicy and delicious, or “heavenly” as they put it. It can be rare to see fresh garden varieties during the winter, but Halo stood tall. I thought about ordering another one, but I decided to let myself down from the weekend easily. Which one did you order?The Bloomin' Burger. It was first created in 2008, is based off the Bloomin' Onion, a large onion cut to look like a flower. After it's cut, it's breaded and deep-fried. Dip the pieces into some of Outback's special Bloomin' Sauce, and you're all set for a great appitizer and about 1,000 calories. When you order a Bloomin' Burger, save the ketchup and mustard and replace it with that yummy Bloomin' Sauce. In fact, they actually give you a side of sauce in case you feel the need to put a little more on. I sure did. Actual pieces from the Bloomin' Onion are placed just below the top bun. It's an Outback, so maybe there's nothing more to add? I don't think there is. Most people have been to an Outback before. This is a great burger if you ever want to switch it up! What's their history? 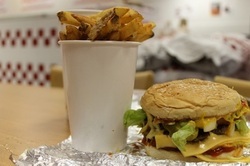 The first Five Guys was set up in Washington D.C. in 1986, and it quickly grew into a local phenomenon. In 2003, they offered up franchising rights, and before they knew it, 300 units had been sold. From there, they've got about 1,000 units serving burgers and another 1,500 in development. Even Obama goes there. What's the place like? When you walk into a Five Guys, it's time to immediately get lost in their red and white color scheme as you head straight for the ordering counter. Five Guys keeps things pretty simple for you, as you've only got four burger options to choose from. You can order a hamburger, cheeseburger, hamburger with bacon, or a cheeseburger with bacon. After you order, enjoy some shelled peanuts while you wait. How's the meat? They proudly claim, right at the counter, that their beef is 100% fresh and never frozen. In fact, Five Guys claims that nothing served from their restaurant is ever frozen - they only have coolers at Five Guys. However, this 2018 report didn't give Five Guys the best rating (F) for their beef. Let's get to the fries. If you are looking for fries, Five Guys does something a little different. They cook their fries in 100% peanut oil. This is something that other restaurants and chains can't claim. When ordering fries, there's only two different kinds to choose from - Five Guys Style and Cajun. Be careful when ordering because you get a ton of them! How's the burger? Really good. Five Guys has always delivered and we're confident they'll continue to serve up a great tasting burger. The bun doesn't take up a lot of space and you can focus on the good stuff. You'll need a lot of napkins. What else is there to know? The Detroit Greektown location serves beer!